Shannon discusses how the gold medal mindset leads to victory on the competition floor, in the boardroom, and in our personal lives. With seven Olympic medals, Shannon utilizes her critical insight to share what it takes to be a winner: the importance of goal setting, leadership, maintaining a positive attitude, and teamwork. Through her Olympic and personal experiences, Shannon explains ways we can overcome even the most difficult obstacles standing in the way of our success. 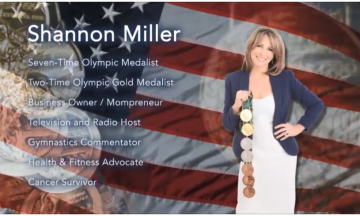 While she may not have been the most talented, flexible, or even the strongest athlete, Shannon Miller was able to utilize these concepts to become The Most Decorated Olympic Gymnast in United States history! Your audience will leave empowered to seal the deal with that next client, work together for a positive outcome, and understand the steps it takes to be a successful leader in both work and life. While much of the world is telling you, “Don’t eat this. Don’t do that,” gold medal Olympian and health advocate, Shannon Miller, shares her message of “everything in moderation”. Most of us do not have 4 hours a day to work out, but that doesn’t mean we should to give up. Eating healthy doesn’t mean giving up everything that you love. Shannon shares the importance of making small changes that have a big impact on your overall health. Through her own experience with weight gain and low self-esteem following her retirement from competition, this Olympian and mother of two, found her way back to a healthy moderation. Your audience will leave with specific goals and motivated to take the next step in their own healthy lifestyle. We will all be touched by cancer at some point- whether it is you, a loved one, a friend, or co-worker. The cancer journey is a unique one for each of us, but it is one that we can follow with dignity and strength. Shannon shares her own cancer journey and how she used lessons learned through her Olympic training to forge ahead in the midst of the most challenging obstacles. She speaks about the importance of caregivers and the incredible role they play. Through her story, your audience will learn the how importance it is to set goals and maintain a positive attitude, the importance of early detection and why “making your health a priority” is a lesson for all of us. Shannon Miller empowers each of us to take control of our own health and arms us with specific ways we can do just that. 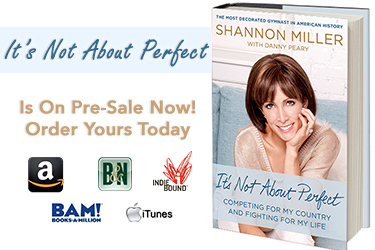 Shannon’s memoir, “It’s Not About Perfect: Competing for My Country and Fighting for My Life” hit store shelves April 21, 2015! Get it today at Barnes & Noble, Amazon, IndieBound, BAM, Apple, and other fine retailers. The publisher can work with you for bulk orders for your event as well. Please contact lauren@shannonmillerlifestyle.com for details. *Please let us know if you have specific needs and we will work with you to tailor a speech to your audience. Book Shannon Miller today! – Darvin D. Towery, President, Graves County High School Eagle Foundation, Inc.